India is planning an elaborate missile shield as part of the Modi government's focus on creating a nuclear missile shield. According to news in the media, India's secretive missile tracking / 'specialized' ocean surveillance ship 'VC11184' (yet to be commissioned) is undergoing harbour trials and is likely to be delivered to the Navy by December. The ship, part of the elaborate missile shield being planned against attacks, being built for the National Technical Research Organization (NTRO), was ordered as part of the Modi government's focus on creating a nuclear missile shield. Sea trials are to follow by a joint team of the Navy and NTRO in which its specialized surveillance systems (three dome shaped antennas packed with sensors), will be extensively tested. The VC11184, one of the largest indigenous warships at over 15,000 tons, built under the Make in India initiative and costing 725 crore, generates over 14 MW of power to operate the tracking radars. It will have multiple roles; from tracking enemy missiles to accurately giving data on tests routinely carried out of indigenous vessels for strategic missiles. High secrecy is being maintained on details, including capabilities and systems on board. Rear Admiral LV Sarath Babu, CMD, Hindustan Shipyard Limited says, "It is a very complex vessel and we have set a new standard for building vessels of such class on time". The keel of the vessel was laid in June 2014 and construction completed in less than five years. Initially constructed in covered dry dock, past several months, the vessel has been docked alongside and is now visible; globe shaped radars gives it distinctive visibility. VC11184 undoubtedly is an excellent addition to India's combat potential but the manner in which it has been projected is possibly to attract votes. If the project is so "secretive", where was the need to publicize it before sea trials and commissioning? The vessel has been in open for 'harbour trials' past several months, which no one queried, and even if someone did, could we have not responded it is meant for hydrological survey? China would have hardly done so until the vessel was fielded in PLA Navy and perhaps even then kept the capabilities secret. The publicity that it is a nuclear missile tracking ship is na�ve, because it will simply track missiles, whether nuclear or non-nuclear. Similarly, to term it a vessel built for NTRO or calling it 'NTRO Ship' is utterly ridiculous. All VC11184 will be doing is, providing inputs to NTRO, like many other platforms. It will be very much an Indian Navy ship. Hope in their exuberance, MoD doesn't start saying particular satellites too are NTRO satellites. India's ballistic missile defence program was conceived many years back, primarily against ballistic missile threat from Pakistan; double-tiered system consisting of two land and sea-based interceptor missiles, namely the Prithvi Air Defence (PAD) missile for high altitude interception, and the Advanced Air Defence (AAD) Missile for lower altitude interception – combined shield aiming to intercept incoming missile launched from 5,000 km away, the system also including overlapping network of early warning and tracking radars, as well as command and control posts. PAD was tested in November 2006, followed by the AAD in December 2007. With the test of the PAD missile, India became the fourth country to have successfully developed an anti-ballistic missile system, after United States, Russia, and Israel, although the system is yet to be officially commissioned. 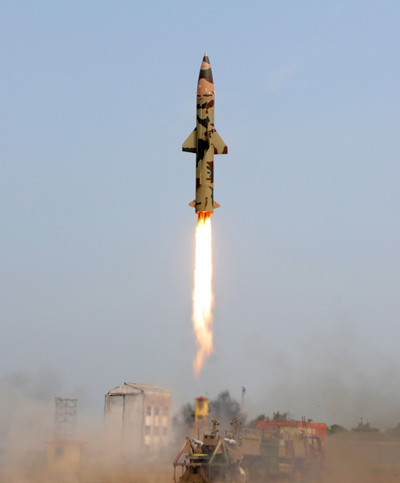 It may also be recalled that on March 6, 2011, India launched its indigenous interceptor missile which destroyed a 'hostile' target ballistic missile, a modified Prithvi, at an altitude of 16 km over the Bay of Bengal. So while, the present government deserves due credit for fast-paced development of VC11184, the credit for conceiving the missile defence system and VC11184 goes many years back; with the government taking office on 26 May 2014 and the keel of VC11184 having been laid in June 2014. VS11184 is an indigenous vessel developed, like many other vessels. Crediting it to the 'Make in India' initiative is wrong since Make in India was launched on 25 September 2014, much after construction of VC11184 commenced. We need to acknowledge that China is the main threat, not Pakistan; not only from mainland China but its CBGs that will be roving the IOR plus numerous bases in countries like Pakistan, Maldives, Sri Lanka and others. And China is putting billions of dollars in R&D for new technologies. Talking about new "invincible" Russian weapons, President Vladimir Putin recently stated Russia has successfully tested a cruise missile with a nuclear-propulsion engine, which would fly at a low altitude and follow an unpredictable flight path to avoid US missile defence systems. He also said, "Every single weapons system discussed today easily surpasses and avoids an antimissile defence system." Last year, Russia tested its new hypervelocity missile system, Zircon, believed capable of travelling about 7400km/h. In 2017, China claimed it had successfully developed hypersonic ramjet engine after a series of eight test flights; ready to be mated to a new generation of air-to-air missiles. Hypersonic implies engine moving at more than 6200km/h. According to western analysts, these new Chinese long-range, super fast missiles may be "undetectable". Notably, China also believes in 'swarm attacks'. These are serious issues that we need to focus on. Prudence demands we brag less, build our capabilities speedily and bide time, not letting the combat asymmetry grow more.